Last week we explored the topic of Random Acts of Kindness. There is now an official day 17th February in which individuals are encouraged to carry out these small acts and this is lovely but it got me thinking ..
Why do we need a day in which to practise kindness? Should we not be practising kindness on a daily basis without thought of repayment or agenda? As I explored the world of the web in search of these recorded acts what I noticed was that we are hit so much more frequently with acts of cruelty.. everywhere on every news page there are headlines of terrible things which have been done to others. Yes there have been some natural disasters and some tragic accidents but on the main we are looking at a web filled with hate stories. It can appear as if we are inherently bad .. the world seems very small and a very scary place with no escape from the atrocities which have occurred. Is it really then any surprise when people are taken aback from kindness from others? Human beings seem programmed now to expect the worst from others and step back and take stock when someone does something just good. I recalled in my FB Live how I went into a well known coffee shop and simply because I looked up from my phone and I wasn’t deaf to their words ( no headphones) – I actually made some small talk and I smiled that I got a free coffee.. they were surprised by my kindness and manners and I was equally surprised by their generosity. People spoke of how individuals were surprised if eye contact was made in the street – some thought is a pre curser to being attacked … and yet as I searched through the stories I saw that actually faith perhaps could be restored – there were stories of providing help for the homeless , of work done for charities by those being treated or effected by life changing conditions , volunteering and communities coming together . I noticed that in stories of dreadful tragedy underneath there were the aftermath stories of the people who supported each other and would not be broken. And it occurred to me that many of these are done without agenda and without need for sharing – just because .. On the other hand one of my listeners raised the point of why we have so many people wanting to share terrible events. For me the answers are two fold – firstly we should admit that we look for drama to read – and drama sells – we only need to look at how the talent shows all seem to be based on the X-Factor story – the worse the story and background the more people route for them. However I also believe that people share for genuine reasons – to share their story to help others and show that people can overcome and that people are not alone in their struggles. So I guess my closing comments are that you can look beyond the bad things , you can find those acts of true kindness and remember that a small act of kindness can truly make a change in someone’s life – don’t wait until next February 17th before you act. It can happen to us all …. If last week saw me feeling like I had lost my mojo a bit, this week saw me heading to totally overwhelm and it was and is time to make some changes.. I was over the moon to have been selected the key speaker for the Tower of London Feminist Fete and yet whilst this should have spurred me on and relit my motivation it seemed to do the exact opposite. I was ignoring the pebbles and the signs that I needed downtime and this week the boulder came along and rolled right over me ! I woke early ( very early ) on Monday morning with a list of things I hadn’t done churning in my mind , things I needed to do .. should do and was behind on .. my morning routine has gone out of the window and I dozed fitfully on and off until the very last minute before needing to wake up my son and get him ready for pre school – all in a quite a brain fog . After one client it seemed the universe had listened because a scheduled photo shoot and a further client all wanted to reschedule .. did I use this time to be uber productive and plough through my list – study and make notes and plan ? No I did not ! – I said thank you very much and crawled back to my bed emerging a couple of hours later to binge watch original Will and Grace . I took the day off ! I thought that would be enough … I was so wrong ..
Tuesday came and I had things to do but I still couldn’t shake the feeling of exhaustion and questioned constantly why I was not totally #onit with the projects I have lined up.. and so we are here on Thursday and I am realising that it is not going to be a quick fix and I need to start practising what I am preaching ! I am in overwhelm – the stress that comes when you have loads to do which should be great but actually leads you to simply wanting to put the duvet over your head.. ( which I did on Monday). And I am right when I say it won’t be fixed over night but I have taken steps which I hope in turn might help you if you are feeling this way ..
Firstly I have asked for help – I have booked meetings with key people such as my uni lecturer , my book coach and my business mentor . I know that meeting with them will be productive in terms of planning and give the confidence boost to see what I have already achieved and can build on. I bit the bullet with uni and asked for an extension also – I haven’t done that all year but I know that it’s needed and will take some of the pressure off. I did something else I don’t normally do and I backtracked on a commitment to be at someone’s event – I knew I was already double booked and it would be a mad rush to prep and I made a good choice to make life slightly easier for myself. I outsourced – I looked through all the meetings and 121 requests and I asked someone I trust to help me do that and take it all over. I allocated short periods of time to completing some key pieces of work so I felt I had achieved something. I also gave myself a break on the – ‘I am not exercising enough and I am not getting up early enough ‘ nag that we often have constantly going on – when I could sleep in I have done that . When I have wanted to watch Loose Women because my brain needs a break – I have done that ..
Plus I have unsubscribed to social media groups where I am constantly seeing how productive other people are being .. because that just wasn’t helping! And today I have looked back over the last few days and I have said actually you have still achieved a lot – you saw all your clients , you found a new home for your community group and a bunch of other stuff that needed to be done ..and everyone is safe and well .. so I have given myself a break again . Like so many of you I am one person juggling many things and overwhelm is your brains way of saying – this is enough now.. I didn’t listen to those first signs so my brain did it’s job and it upped the stakes until I couldn’t ignore it anymore. I know that if I tried to keep going the way I had been I will be on the floor. In our society we see so much pressure to be on point all of the time – with very little downtime. We talk of self care but we pack our schedules with appointments and our self care can become stressful in itself- am I meditating every day , am I prepping the right foods , do I take down time and read the right books .. we can start to self care in a way that is all about achieving and therefore loses the benefit. Playing By Whose Rules ? In the ongoing campaign for equal rights are we now having to conform to a new set of rules ? Slightly different vibe this week but it’s a topic which has been on my mind a lot and will continue to be in the coming months. I am currently in study mode ( no change there) but I am studying this time a lady known as Leonora Cohen. Perhaps not as famous as one of her counter parts Emily Pankhurst – Leonora is known as The Tower Suffragette. In February of 1913 Leonora gained access as a visitor to the Tower of London and entered the Jewel House – where she took an iron bar from under her coat and promptly smashed the case containing the The Insignia of the Order of Merit – wrapped around the bar was note explaining that this was to ask for Deeds – Not Words and raise awareness of the ongoing campaign to gain the right to vote for women – something that would take a further 5 years to even start to become legal. The Suffragettes and the less prominent but just as passionate Suffragists were indeed campaigning for equal voting rights – the chance to have a voice. This movement for equal right and the ongoing Feminist movement continue to this day and of course there has been much in the news recently regarding both gender pay gap and continued sexual harassment of women in the workplace. I see my self as a feminist . Certainly I am a keen advocate for women to achieve and parts of my business are set up specifically to enable women from all backgrounds to do this But I am also I will admit a little nervous now of the word and I also wonder if my own views are up to date and this has been brought into question all the more by 2 things which may at first not appear linked – the banning of the board girls in F1 and Darts and the fact that this week I was asked by Historical Royal Palaces to be a lead speaker in their up and coming recreation of the 1909 Feminist Fete – speaking about women achieving , raising confidence and discussing the way the campaign is now being continued in present day. It is of course an amazing honour to bring my Roar workshop to the Tower of London – and I had a most engaging conversation with Rosanagh from their learning department on the way women in history have been portrayed and treated by the institutions such as the Tower and how we should start to learn their real stories. So where is the link – well because I, like it seems many women I have spoken to, am baffled by the recent ban on women carrying the board at the events mentioned. For me equality and feminism is also about choice . The right to choose my occupation , the right to be seen as I wish to be seen. For sure educating women about equal opportunities and allowing them from an early age to understand options can be limitless is vitally important. The right to be heard, the be paid equally and for parents to have childcare options which do not then effect career or pay structure – this all must be addressed.But when we start to dictate what is right when there is no exploitation and there is a clear choice – and we then remove that choice – I feel uncomfortable. I feel as though we are in a society which now wants to have everyone be included but then makes a lot of rules and labels to ensure people then conform to beliefs which are seen to be right. Who decided this wasn’t right , who was offended , who are the They that can make these types of decisions for other people. I will give another example of where I may be out of touch – I was very happy to take my husbands name and yet a friend was just recently telling me how someone berated her for an archaic system.. which brings me back to choice, if you don’t want to – then don’t but there is almost a unspoken thing which states that there is a right choice and a wrong choice and if you are on the wrong side are you a feminist ? .. and don’t get me started on the recent story of some poor women who asked for ideas for her husbands sandwich’s which she CHOOSES to make daily – and instead of answers such as ham and mustard she got a whole host of opinions about how she must be oppressed , was not working with the sisterhood and what was wrong with her life. Why must we assume that she is oppressed or forced and why can we not just simply accept that women make choices in many aspects of their lives .. some will fit our views and some won’t . Can this woman a feminist ? – I believe she can – others won’t. Choice was what we wanted – the right to say how we lived our lives and yet now we seem to putting pressure back on ourselves to conform to a new set of rules…. And choice is my point with recent ban. We have removed choice and anyone who disgrees risks being seen as a bit behind the times. Are the women who have helped place the ban feminists or or the women who worked in the industry , strong indpendant women – are they feminists ? By the way whilst my head may be very much on the chopping board here I will also say say I find a wolf whistle very flattering – it is isn’t degrading to me and there is a clear difference between harassment and a wolf whistle which for me brings a smile to my face! .. btw it appears it is still OK for women to make comments about men ? ! So as a plan my talk for the Tower on the 13th May and I consider the debates I have in my Roar workshops I find myself questioning some of the new rules of the world we live in – where it will go and of course whether I may be at the grand old age of 44.5 already out of touch. I am looking forward to some lively discussions at the May event and I remain firmly interested in where we shall see future generations heading and in ensuring women can truly be the person they wish to be… and I wonder what Leonora would have thought of the world we live in and whether she would feel we had made progress? Overcoming and Working Through Depression. It was an emotional start to the week in Bemoore as my Life Challenges radio show hosted the amazing Hannah Armitage of Mum’s Life. She is now making her name as an on-line influencer – Hannah is confident , well presented and bubbly. It was a delight to interview her – and she is a radio presenter in her own right! So it was a honour that Hannah chose to talk about an event in her past that led to depression and her overcoming through therapy. It may also have been potentially a surprise to those that see her public persona.that Hannah had not always felt like the confident sparkly young woman she presented herself as. However it is not an uncommon story – many individuals will be able to put on their game face, get out there and be the person they need to be – all the while hiding the feelings which can be all-consuming and prevent them from embracing what life has to offer. Depression can come over someone for many reasons but two types are the depression caused by experiencing a specific event which you can remember and pin point as a starting point. The other feels as though it just appeared and you cannot understand what has happened to cause it. This could be due to chemical changes in your body – a physical process you are going through ( think of post natal depression for example) or it could be that there was an event you experienced and you are not able to recall it because it happened when you were very young or your memory has chosen to suppress it..
Depression itself can feel a very lonely place and yet it is the world’s leading mental health problem and in 2013 a survey by mental health.org showed it to be the leading cause for disability in 26 countries. Scary as those statistics are the fact is you are not alone and there is no shame in seeking support. symptoms vary according to individuals – ranging from just not feeling themselves to insomnia or the need to always sleep , changes in relationship with foods ( not eating enough or binge eating) , leading to poor concentration and lack of energy, feelings of guilt and a drop in confidence and self-worth. People will describe at a physical tangible thing which is upon them and Winston Churchill famously described it as his black dog which followed him. People may experience strange thoughts and or dreams – remind me to tell my own story of the chimp that I created which became the big boulder of a hint that it was time I got myself sorted ! We are thankfully seeing a big change in people being able to talk about mental health problems and sharing your feelings and thoughts is the first step to getting support. Find someone you can simply confide in and also see your GP who will help to identify what additional support will help. This could involve medication and or counselling or therapy. Take small steps to review what is going on in life – make time to look after yourself and start to look for those small but important positives that you have on a daily basis – even getting out of the bed in the morning is a big achievement so celebrate it. Overall listen to your gut instinct. You will get small signs that things are not right and if you try to ignore them they will just grow.. Oprah talks of listening to the sand and the pebbles otherwise they will become rocks and then a boulder which will come hit you upside the head. 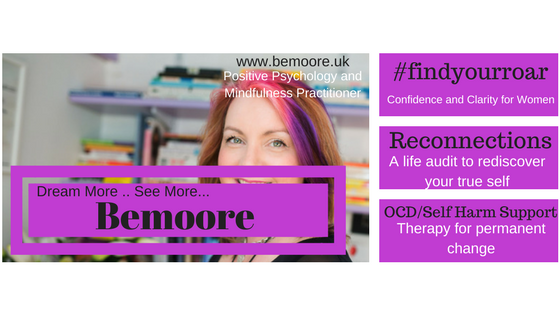 There is so much I could write about this topic and a blog just doesn’t do it justice but if you want on-line support why not come over to my FaceBook Group Bemoore -Reconnections where there are loads of hints and tips and lots of fabulous people supporting each other. My final message is that recovery is possible. Through initial medication , therapy and support I ( just like Hannah) was able to overcome and create a life filled with purpose – it actually led me to where I am today supporting others to be able to do the same. At the start of this week the country connected with Blue Monday. In that way in which we name our days to attach an importance or a feeling/ behaviour with them – like the dreadful Black Friday or Cyber Monday, we have deemed that Monday in January to be the time when everything Christmas and New Year and glittery and bright is a distant memory. The credit cards bills are landing and the children have moved on from the presents and are already focusing on what next .. However it was also a national week asking us to Hunt for Happiness – in an emotional sense might I add! .So here in the world of Bemoore it seemed like a great topic to explore. Why are we so often searching for that happiness? What is it that is missing from our lives that creates a need to look for something more ? Now happiness is not an tangible thing. It is an emotion , a feeling and this is created by our own brain processing information. It is something that happens within our mind and our body and yet we are looking for it outside… of course what we are in fact looking for is that tangible thing we can attach the emotion of happiness with. The problem we then have is we need to have something external in order to bring forward that feeling of happiness ongoing. .. and the more we bring it forward the more we believe that we need more stuff to keep feeling happy – remember my blog on the compulsive buyers ( and I have certainly been there myself!). People’s lives are filled with sentences that start ..’ if only I had ‘ .. If only I changed .. If only it was different .. When I get to …. Then I will be happy !’ and yet even when people get those things or get to where they thought they wanted to be .. they are already looking for next big thing. On my radio show this week I had two wonderful guests – Anna Parker- Naples Founder of Inspiring Mummies Club and a fellow Mindfulness practitioner and Sharon Rai – Enabler at the Entrepreneurial Spark Program run by Natwest nationally for start up businesses. Both of them had experienced events in their life which meant they saw that happiness could come from a different place. For Anna it was after a health scare and then her ability to find happiness inspiring others around her.. For Sharon it was seeing that the glamour of the high corporate consultancy life didn’t actually fulfil her and she made the big jump into the world of social enterprise and again found happiness helping others get started. We all agreed that happiness is actually within us and it is within us we need to look. I think it links so well to another of my favourite topics – purpose. And I think this is also why we see people embracing a return to minimalism or coming away from the instagram life where we are bombarded with perfect images of lives we could have ( but actually don’t even exist) and seeking peace in retreats for the mind and the body. I loved the quote that came up on my FB Live on Wednesday from Wendy- comparison is the thief of joy ! – that is truth! For me I found happiness again in similar way – I knew I could give something back and help others find their path and that’s the shape of my business going forward. So look for those small things that create that feeling : they are all around you – these are some of our favourites – thank you Ellen for getting us started..
Clean Sheets, popping bubble wrap , stroking cats , the licking of the yoghurt pot lid, throwing leaves in the air and watching them fall , blowing bubbles through a child’s bubble wand , a good book , a hug, the small crunchy chips at the bottom of the bag, doing something which makes someone else’s life easier .. and my secret vice .. dipping salt and vinegar crisps into hot chocolate ( don’t knock it till you tried it)..
Well it’s not only the end of the Intention and Purpose week here at Bemoore but the end of my first proper week back in the business and on the business after Christmas and New Year. Firstly how long ago does that all feel ? My intention this week ( see what I did there ? ) was to look at goals and resolutions but from a different aspect and I will touch on this in a moment, however sitting here on a Friday evening waiting for the family to return, it has also been a moment of reflection on my own intentions at the start of the year. Those that follow me will know I was feeling frazzled. I was feeling like instead of working on what I truly enjoy – which is helping others to find ways forward – I was chasing all the shiny stuff, getting caught up in the who had the best clients and the most PR opportunities and it was feeling at odds. So I made the decision that everything I did this year would be about purpose. I would question my choices to ensure they were in line with that purpose and focus on working with clients that wanted to move forward and focus on enjoying my business and being true in my intentions. … I was putting it in the hands of the universe that if I put my energies into this way of working the business side would come together. … and this week has been testimont to that belief! The therapy room has been filled with amazing individuals with many different asks, but all wanting to explore their journey, I have met some fabulous new contacts , had wonderful enquiries about future work and connected with new opportunities which have opened doors. Each day has seen a step forward and the best bit is that everything I am now working on and everyone I am working with feels congruent with how I want it to be. In my FB live this week I talked about working from your purpose first rather than making great lists of ‘To Do’s then falling off the wagon just a few weeks in. Looking to see what is going on in your life now and what is working for you and what is at odds with your intentions. Also exploring how you are defined and by what titles and again how this feels in terms of your future journey. Having done that you can think about what you would like to be different and only then at that point start to think about the actions that will take you to that new place. Often after this exercise clients will find that many of the items on their original to do list are no longer relevant. Their new list ensures goals are focused on what they have defined as the changes they really want to make – and because of this these goals and actions are much more likely to stick. So why not do a final review of where you are before the year really starts to ramp up? Next week we are on the Hunt for Happiness and don’t forget you can listen in again next week Monday 7pm – 8pm on Secklow Sounds 105.5fm ( http://www.secklow.org) to hear my fabulous guest talk about their own hunt for happiness. Before you look to make change celebrate what you already have ! If last week was a chance to be still and reflect then this week is about being fully in the present and it’s National Celebration of Life Week so what a fabulous reminder to look around us and celebrate what is going on for us right now ! For many people life can range from mundane to down right difficult to deal with and we are bombarded with the negative through all media outlets. Celebrations can be hard to find and even for those that are on an even keel, celebration can be seen as something saved for the big events. And yet understanding what is happening in our lives in the moment , looking at what we already have and seeing the small details which make our life what it is are vital components in drafting your future journey .. once again at this time when it’s all about goals – making things bigger , better ,changing , doing more or less of stuff doesn’t it make sense to understand also appreciate what is just there now. That is what you need to nurture and love and grow. .. and of course being in the now and being present – that’s mindful living ! I heard a wonderful description of the visual world we live in – when we take the photo which used to be for memory and to cherish and now is all about creating the perfect image of a perfect world. We become so obsessed with the taking of the image and the look of the image we almost forget the moment we are capturing. … and yet if we stopped we might see that in that moment we had it all – right there – right then .. we had it all .. but we didn’t see it and we didn’t celebrate it and when we finally look up the moment is lost and sometimes the people are lost as well. Putting on the hob light in the early morning before the house wakes up. Hearing the whistle of the kettle on the gas hob ready for that first cup tea. The first cup of tea – which I love so much I posted about recently. And that’s 3 before I have even got out of my PJ’s! not very exciting and would pass many people by ..
… and yet that is the start of celebrating – each small thing which brightens our day creates that positive mind-set. I recently asked my social media community how they celebrated – mine was very food related. Having been bullied to the point of home schooling and used food as a way of control I now see food as something to be enjoyed ..I was smiling when I saw so many people agreeing and of course opening the bottle of bubbles – any excuse for me ( in moderation of course.) But also things such as driving in the sun to remind them of the summer months to come are all ways to embrace and celebrate the life we have. So as you start this year and think about the adventures to come remember to stop and make time to celebrate your life right now , your people right now and look to see what you already have ! It’s all about those in-between days and the wiping of the slate …. Christmas we all get – the build up and the preparation. There is a plan of action and there are traditions to keep which give us structure. It comes at a perfect time .. right at the end of the year so we can pack it all away and get ready to start again .. but … there is that slight problem. Between the Christmas and the New Year we have ‘ those days’ .. the in between days.. the days with no name. They start after Boxing Day …and the question is what then? For many of course and for me in the past they have been normal working days – although feeling a bit odd if I am honest. They just don’t feel like other days – they feel as though we are waiting for something, so even going about our normal day to day business just feels a bit different. People are so keen to try and move through them we have started to name days at the other end – New Year’s Eve Eve for example the day before the day before. So keen are we to just get going. Added to this everywhere is all about starting again, making resolutions, making lists, planning for next year, moving on so that you feel as though you have somehow failed if you haven’t filled in your personal journal and planner with events right up to next summer at least, committed to a whole new you and committed to eating only green foods in liquid form for at least the first 3 months! But this year after finishing my first full year as self employed I reached these days and suddenly I realised something. I was so caught up in the moving forward and it was driven partly by my own motivation – good – and partly by comparing myself to what everyone else seemed to be doing. Social media is full of posts stating that people are getting amazing clients , filling workshops to sold out , taking big opportunities and already having one foot in 2018…and I realised I was procrastinating yet being busy – but not really getting stuff done so it was time to do something I hadn’t done in quite a while.. and I wasn’t enjoying it because it was based on what other people’s success was all about and it was time to STOP! The main reason we procrastinate is because we either feel overwhelmed or we are unsure of where our journey will take us. The remedy to both is to stop , to listen , to reconnect with your inner thoughts , to be mindful of course and to do this you need to have quiet. I call it surfing the urge with clients when they are compelled to do something and so I did just that – I surfed through the urge to get started on next year and I made time in the in between days to really listen to what my soul was saying. At first it was hard, I wanted to be working on stuff, to fill my time and of course there was guilt about having time off .. but then through the quiet it clicked and I had that ah ha moment. I stopped long enough to hear my own voice and I got the answers I was searching for . I listened to the silence, I embraced the down time , I waited in the waiting days and then I knew! So now I sit here on New Year’s Eve ready to embrace 2018, clearer than I ever have been in my intentions and looking forward to the opportunities to come .. but also reminded of the need to build in time, time to think , to plan , to be with others, to reconnect with self , to clear the diary and to listen to the world in that moment around me. Have a wonderful start to your New Year – make each day count , be kind and every so often just stop and see how much the silence can tell you. Memories are Made of This …..
First Learn to Be Silent , Then to Experience Silence and only then to Question the Silence …. Memories are funny old things really .. as soon as an event has happened and we start to replay it from memory we create a whole new view on it.. we highlight the pieces we want to remember , the pieces we think we remember , the bits that stood out .. we forget or file away pieces that don’t interest us or are potentially too traumatic to focus on .. and hence the memory becomes our reality .. but it is not reality. I do a lot of memory work with clients so I often find myself that memories of my own from many years ago will just pop into my head .. no apparent reason and normally with no adverse effects, although like all therapists we have steps in place should that happen .. funny how the memory was like it wasn’t even there and then it’s like watching an old movie and everything comes back .. the sensations , the emotions , the smells even . .. and then there are those key moments – memories of a time when you fixed a moment in your mind. You know when you sit somewhere and say I will always remember this moment .. in 10 years time I will look back and remember this …. Memories in therapy can work in many ways – focusing on memories of happiness will bring back that emotion , focusing on key events can provide anchors when life seems chaotic. Memories have been on my mind a lot in recent weeks and perhaps throughout this year along with a feeling of disquiet…. As a scientist I would say its because of the client work I do and because I am running at full pace at the moment, setting up events , launching a new business and still spending far too much time in the social media world, taking in lots of bite size pieces of information rather than digesting and savouring learning .. But as a Pagan ( albeit rather lapsed) I would say it’s because we are reaching the end of the Pagan year – Samhain for us marks the final turn of our Wheel of the Year when dig down through the darkest days and wait to celebrate the return of the light at Yule . Like all new years a time for refresh and reflection . Perhaps also memories are on my mind as it sees some key years coming to pass – both my daughters had banner birthdays – 21 and 18 which mean looking back at old photographs , reminiscing and of course thinking where did the years go – how old do I feel !! I was 44 this year and that for me feels like a turning point – 45 seems the start of the next stage of life I guess. Then of course there is the combination of the changing of the year and a key memory which changed my life – for there is also another banner birthday this year – that of my eldest son Kieran who would have celebrated his 10th birthday. The first big birthday. But Kieran was born asleep and so along with his birthday is a whole host of emotions of sadness and grief and what if’s … memory of this time is hard but also important and the current #onemoreminute campaign and the fact that it is baby and child loss awareness month in October has of course had me thinking about the memories I have ( not that I don’t always do that). In the early years each anniversary was a reflection on all consuming loss that is felt when a child dies. In more recent I now work to focus on the few memories that remind me that I was and always will be his mum. ..I can still smell that baby smell as I held him and I can remember like only yesterday sitting next to his crib in the hospital to keep my vigil that one and only night I had with him. I can also clearly remember feeling so anguished that in 10 years time he would be just a memory – a baby in a photograph.. and yet now we are there in the future I foresaw I know that isn’t true at all. Because he is so much more than a memory. The loss of Kieran brought about a fundamental shift in my life – a huge change for the people involved alongside overwhelming , gut wrenching grief … but in the years that came a feeling of wanting to make each day count, to do something of value , to work with others and help them see that you can achieve whatever your circumstances gave me a strength and a point… and that got me where I am now. And so nearly 10 years to the day ( his birthday is on the 4th November) I will cherish those memories and create ones which fill me with pride and purpose. They may not be exact to the real events but that doesn’t matter .. because our memories are how we choose to learn. So take some time and reflect , wander down memory lane and perhaps create a new focus point right now to look back on in another 10 years… I never imagined I would be where I am now, at that moment in that hospital as I looked at my beautiful son to say goodbye.. but in 10 years time I will look back and remember that I was happy now, that we lived in a wonderful cottage called the Three Fishes next to our favourite pub .. and that 10 years on life was good… and I will lean into the disquiet and let it settle , I will look to not fight against it but to explore it as Mindfulness teaches us .. and then see where life takes me next. ps I thought a lot about sharing this story hence why my blog has been rather sparse lately but one thing I wanted to be certain of was that he is not forgotten and therefore just as I write about my other children I write about him … and also I hope that others might see that life can good again .. you can be happy .. it will never be as it was – you will never be as you were .. but it can be good. Switch off to Switch On! The average social media user checks in every 6.5 MINUTES that’s around 150 times a day ! – so says the research carried out by Arianna Huffington for her Thrive book .. and I am a guilty addict .. so it needed to change …..
‘I am writing this blog initially in a pink pen on a notepad . Yes actual writing – not on a screen , not with my thumbs or clicking on keyboard – but physically moving my pen over the page , feeling it’s smooth movement and realising how much focus is needed to form the letters … and how slow I am at it! You see I am having a digital detox day – no social media or checking of messages .. and already I am feeling calmer and more relaxed. As someone who is an avid ‘ poster’ – I have 4 FB pages inc home and business , a twitter , an Instagram and a Linked in plus both home and business email accounts it seems I am on line A LOT! But not just when I need to be . I am permanently attached to my phone, checking it , picking it up , carrying it with me , worrying where I put it – not even able to get out of the car without looking at it. I was convinced for a while I was connected , learning and taking part in the world – always engaged and up to date but since becoming a practitioner or mindfulness ( hence the creation of my Reconnection Project and Journal Program) and mindfulness becoming a big part of my life, I have started to become aware of some worrying behaviours. Anxiety constantly over where the said phone was! Lack of attention with no ability to focus for more than a few minutes at a task before needing to check in again! Worrying memory issues from constant short bursts of short pieces of info that I rarely read in-depth, which led to me having difficulty remembering anything at all. Never truly engaged especially with my young son – I would be with him whilst he played but I would be on screen time so never fully present and experiencing this precious time with him. On top of all of these I have become disillusioned with the images and news I am reading. suddenly seeing images of tortured animals and experimentations and horrific news – especially those where people think saying Amen will do any good. being asked to cut and paste and being basically told if I didn’t I was a dreadful human being. The seemingly endless petitions which are now so easy to just click and share – no effort needed to support a cause anymore. .. and who follows up on everything they clicked on ? and finally the feeling of motion sickness and headaches caused by the scrolling action which my eyes have taken offense to. And so on Saturday I decided to disconnect! and writing this late on Saturday afternoon it’s been a revelation already. Suddenly I am aware of what is going in the world – the real world – like spending time with my family at our favourite café – instead of sitting there on my phone I am reading stories to my son and chatting to my husband ( who is slightly disgruntled as he is still connected and trying to invade an imaginary land). Watching a film together and really watching it – seeing my son so excited when his favourite character came on and realising that he could say the words of certain scenes – who knew ? I have noticed of course how much others are firmly still head down – my whole family including my young son were all on devices on Saturday evening so there was no one there to talk to .. I shall gently tackle this on going plus I realised how much of an ‘ addict I was ‘ – after the initial first day of enjoyment there was also some anxiety about not checking in which worried me but in turn reminded me that this project is important to our mental wellbeing .. So I will work to resist the urge to live in a virtual world and strive be mindful in the present.